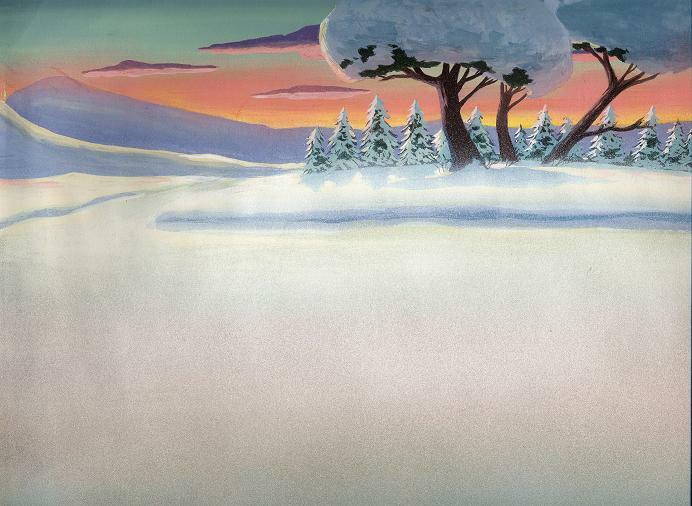 The Adventures of Pow Wow first appeared from January 30, 1949 through March 13, 1949 as a very limited-animation local 15 minute Sunday morning program on New York's WNBT-TV. It reappeared in 1956 as a series of 39 five minute black and white films on CBS-TV's Captain Kangaroo show. Pow Wow was syndicated by Screen Gems to the eleven western U.S. states which did not air Captain Kangaroo at the time. Based on Indian folklore, the fables included 'How the Fox Got His White-Tipped Tale', 'Pow Wow and the Stork', 'How the Rabbit Got His Hop', 'Pow Wow and Playing Possum', and 'How the Turtle Got His Shell'. The series left Captain Kangaroo's show in early 1958 and was syndicated beginning in May, 1958 as filler for local kid shows. 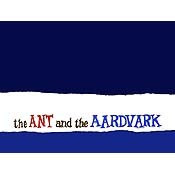 In New York the later shorts were aired Saturday mornings on WRCA-TV (later WNBC-TV) as part of Ray Forrest's Children's Theater (which also aired the original Jay Ward-Alex Anderson Crusader Rabbit cartoons). In Chicago they appeared on WGN-TV's Garfield Goose and Friends. 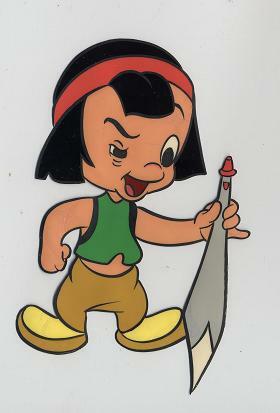 Tele-Features, the company which distributed Sam Singer's Courageous Cat and Minute Mouse cartoons, took over syndication of The Adventures of Pow Wow in 1960. # TT 1 - 'Pow Wow The Indian Boy', Circa 1949. # TT 1 - Tempe-Toons - 'Pow Wow The Indian Boy', Circa 1949. Tempe-Toons (Hollywood-Leon Tempe Marcus) Original office Production drawing of characters-in relative size to each other inclusive of date, measuring a very large 9.00" X 24.25". The image area is so large my scanner can not project the full sheet. So look to the right of this first image for the second half. Characters include: Pow Wow (Indian boy), Indian girl, crow, dog, beaver, Buster cub, Dusty deer, Ruffy bear, Topsy turtle, Fabian fox, and rabbit. First half of image is to the left due to the extreme size of drawing. #TT 2 - 'Pow Wow The Indian Boy', Circa 1949. 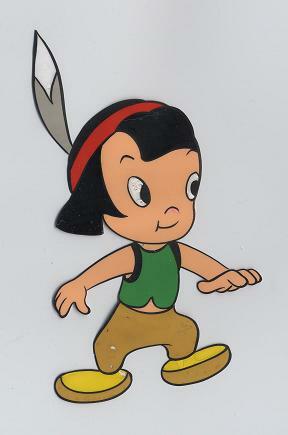 #TT 2 - Tempe-Toons - 'Pow Wow The Indian Boy', Circa 1949. 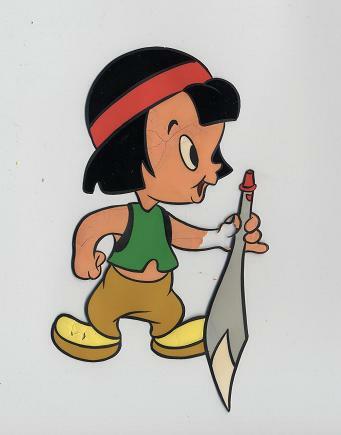 Tempe-Toons (Hollywood-Leon Tempe Marcus) Production cel of Pow Wow the little Indian boy on a clear acetone Cel 12.50' X 10.50'. The image area measures 3.00" X 5.00", bearing number 15 in right hand corner. #TT 3 - 'Pow Wow The Indian Boy', Circa 1949. 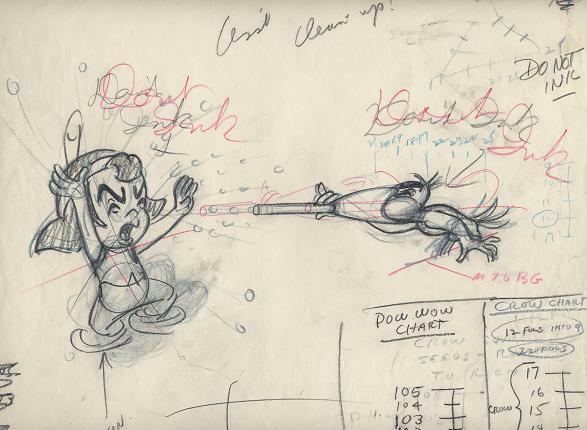 Price: $350 #TT 3 - Tempe-Toons - Tempe-Toons - 'Pow Wow The Indian Boy', Circa 1949. Tempe-Toons (Hollywood-Leon Tempe Marcus) Production cel of Pow Wow the little Indian boy on a clear acetone Cel 12.50" X 10.50". The image area measures 3.00" X 5.00", bearing number 16 in right hand corner. #TT 8 - Tempe-Toons - 'Pow Wow The Indian Boy', Circa 1949. Tempe-Toons (Hollywood-Leon Tempe Marcus) Original watercolor background, measuring 14.00" X 10.50". This absolutely stunning gouache painting of a winter pond is rendered on a heavy stock watercolor art paper, bearing number 40 in right hand corner. #TT 9 - Tempe-Toons - 'Pow Wow The Indian Boy', Circa 1949. Tempe-Toons (Hollywood-Leon Tempe Marcus) Original watercolor background, measuring 12.50" X 10.50". 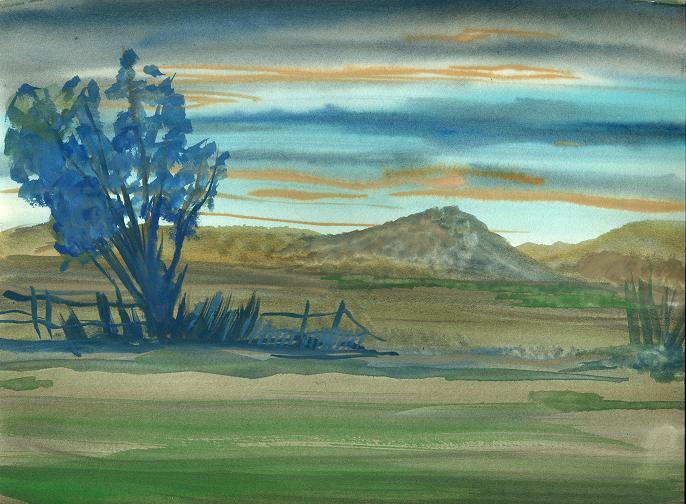 This absolutely stunning gouache painting of a spring/summer meadow is rendered on a heavy stock watercolor art paper, bearing number PT.15 SC4 along top right hand corner. #TT 10 - Ruffy Bear - 'Pow Wow The Indian Boy', Circa 1949. #TT 10 - Tempe-Toons - 'Pow Wow The Indian Boy', Circa 1949. 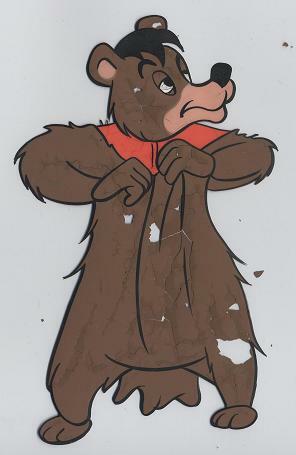 Ruffy bear is on a clear acetone Cel 12.50' X 10.50'. The image area measures 3.50" X 5.50", bearing number B4 in right hand corner. #TT 11 - 'Powee' - Pow Wow The Indian Boy (c.1949). #TT 11 - Tempe-Toons - Pow Wow The Indian Boy, 'Powee' Circa 1949. 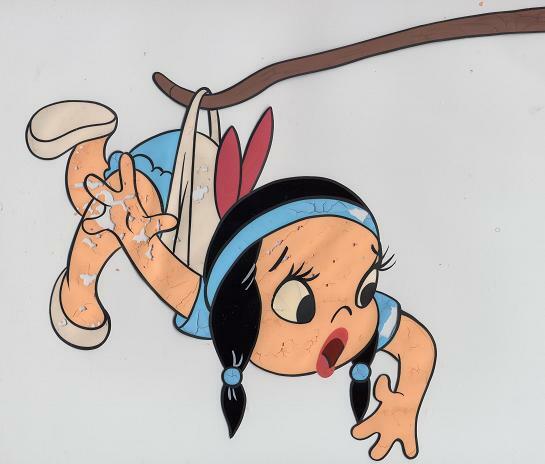 Indian girl is on a clear acetone Cel 12.50' X 10.50'. The image area measures 6.50" X 6.00", bearing numbers PT11 - SC12 - 9 in right hand corner. Paint chipping. #TT 12 - Buster Cub - 'Pow Wow The Indian Boy', Circa 1949. #TT 12 - Tempe-Toons - 'Pow Wow The Indian Boy', Circa 1949. 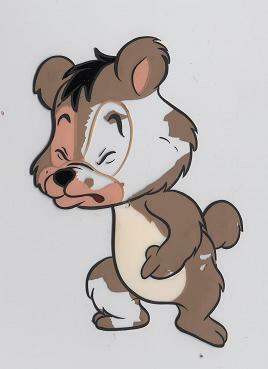 Buster cub is on a clear acetone Cel 12.50" X 10.50". The image area measures 2.50" X 3.50", bearing numbers PT11-SC-24 - I in right hand corner. Paint chipping. #TT 13 - 'Pow Wow The Indian Boy', Circa 1949. #TT 13 - Tempe-Toons - 'Pow Wow The Indian Boy', Circa 1949. Pow Wow (Indian boy), is on a clear acetone Cel 12.50" X 10.50". The image area measures 2.00" X 5.00", bearing numbers 28 in right hand corner. #TT 15 - 'Pow Wow The Indian Boy', Circa 1949. #TT 15 - Tempe-Toons - 'Pow Wow The Indian Boy', Circa 1949. Pow Wow (Indian boy), is on a clear acetone Cel 12.50" X 10.50". The image area measures 3.00" X 5.00", bearing numbers 26 in right hand corner. #TT 17 - 'Pow Wow The Indian Boy', Circa 1949. #TT 17 - Tempe-Toons - 'Pow Wow The Indian Boy', Circa 1949. Pow Wow (Indian boy), is on a clear acetone Cel 12.50" X 10.50". The image area measures 2.50" X 5.00", bearing numbers 14 in right hand corner. Paint chipping. 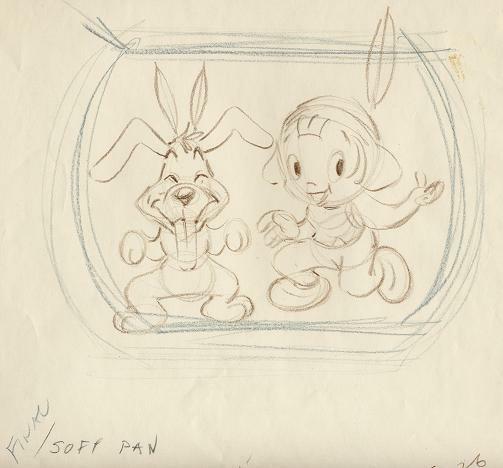 #TT 18 - Ruffy The Rabbit - 'Pow Wow The Indian Boy', Circa 1949. #TT 18 - Tempe-Toons - 'Pow Wow The Indian Boy', Circa 1949. 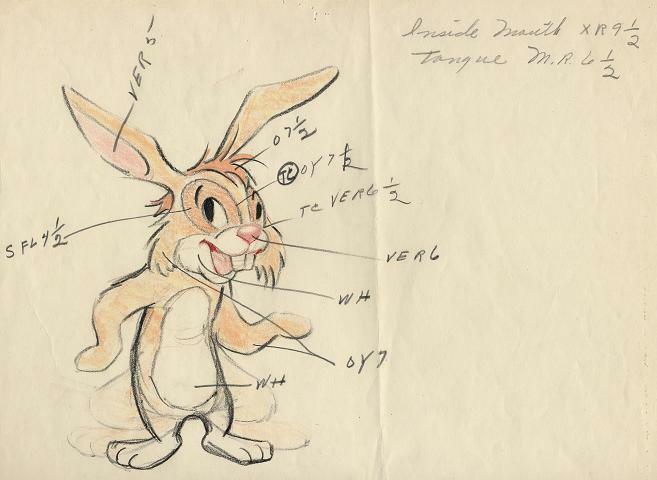 The Original model drawing of 'Ruffy' the rabbit is on a Full Sheet (12.50" X 10.50"). The image area measures 4.00" X 7.00", rendered in graphite, yellow and red pencil. The sheet also includes several important animator notes. #TT 19 - The Crow - 'Pow Wow The Indian Boy', Circa 1949. #TT 19 - Tempe-Toons - 'Pow Wow The Indian Boy', Circa 1949. 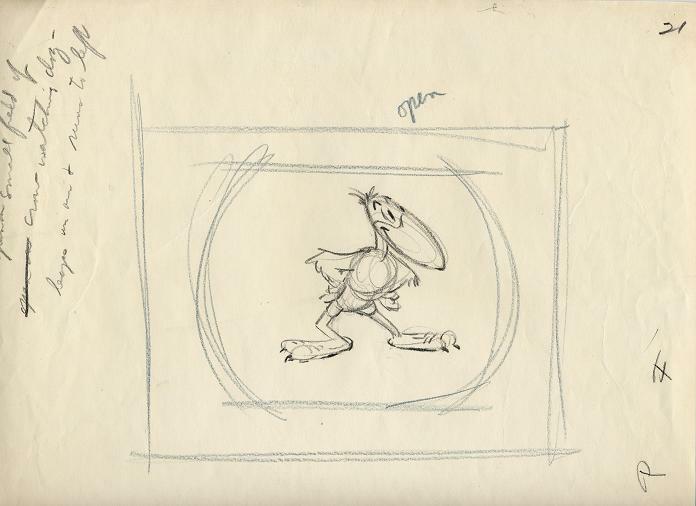 The Original model drawing of the 'Crow' is on a Full Sheet (12.50" X 10.50"). The image area measures 3.00" X 3.50", rendered in graphite pencil. The sheet also includes several important animator notes, bearing PT-15 - SC20 - A across the bottom. #TT 20 - The Crow - 'Pow Wow The Indian Boy', Circa 1949. #TT 20 - Tempe-Toons - 'Pow Wow The Indian Boy', Circa 1949. The Original model drawing of the 'Crow' is on a Full Sheet (12.50" X 10.50"). The image area measures 7.00" X 5.50", rendered in graphite pencil. The sheet also includes several important animator notes, bearing PT-15 - SC21 - A across the bottom. #TT 14 - Ruffy Bear - 'Pow Wow The Indian Boy', Circa 1949. #TT 14 - Tempe-Toons - 'Pow Wow The Indian Boy', Circa 1949. 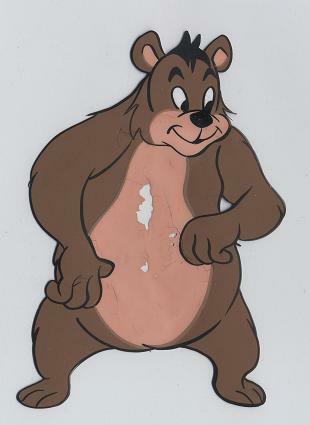 Ruffy bear is on a clear acetone Cel 12.50" X 10.50". The image area measures 3.50" X 5.50", bearing number 6A in right hand corner. Paint chipping. #TT 23 - Ruffy The Rabbit - 'Pow Wow The Indian Boy', Circa 1949. #TT 23 - Tempe-Toons - 'Pow Wow The Indian Boy', Circa 1949. 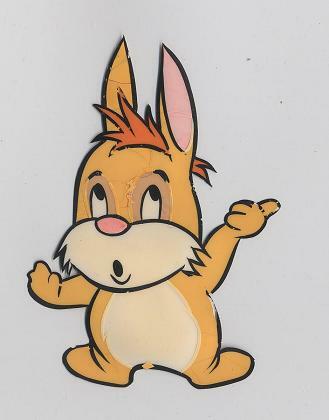 Ruffy the rabbit, is on a clear acetone Cel 12.50" X 10.50". The image area measures 2.50" X 3.25", bearing numbers 62 11 7A in right hand corner. #TT 22 - 'Pow Wow The Indian Boy', Circa 1949. #TT 22 - Tempe-Toons - 'Pow Wow The Indian Boy', Circa 1949. 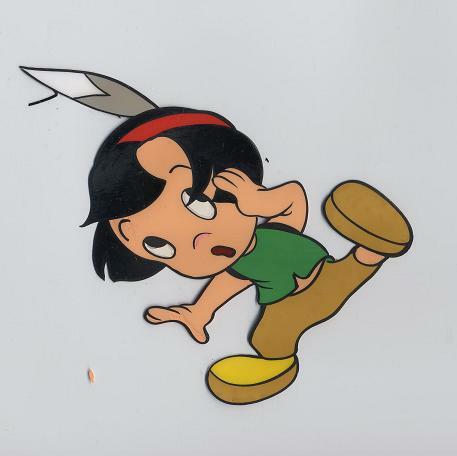 Pow Wow (Indian boy), is on a clear acetone Cel 12.50" X 10.50". The image area measures 3.75" X 3.75", bearing numbers 23 in right hand corner. 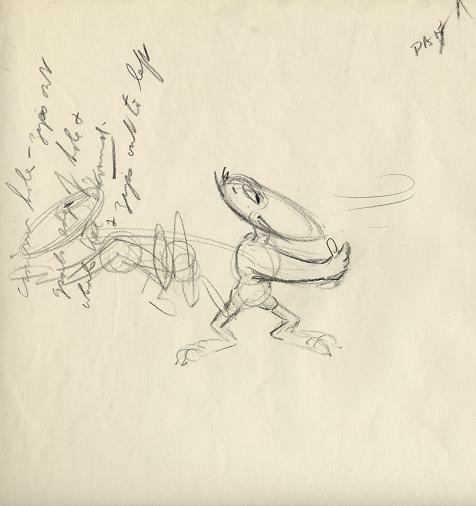 #TT 26 - Original model drawing of 'Pow Wow' and 'Crow', Circa 1949. #TT 26 - Tempe-Toons - 'Pow Wow The Indian Boy', Circa 1949. The Original model drawing of 'Pow Wow' and 'Crow' is on a Full Sheet (12.50" X 10.50"). The image area measures 9.50" X 5.00", rendered in graphite pencil. The sheet also includes several important animator notes, bearing 105 and 17 across the bottom right corner. #TT 25 - Original model drawing of 'Pow Wow' and 'Fourpaws', Circa 1949. #TT 25 - Tempe-Toons - 'Pow Wow The Indian Boy', Circa 1949. The Original model drawing of 'Pow Wow' and his faithful Dog 'Fourpaws' is on a Full Sheet (12.50" X 10.50"). The image area measures 7.00" X 5.00", rendered in graphite pencil. The sheet also includes several important animator notes, bearing SC 26 across the bottom right corner. #TT 24 - Original model drawing of 'Fourpaws', Circa 1949. 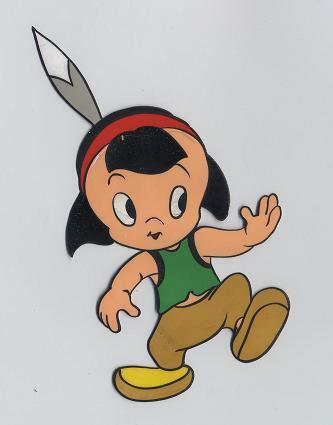 #TT 24 - Tempe-Toons - 'Pow Wow The Indian Boy', Circa 1949. 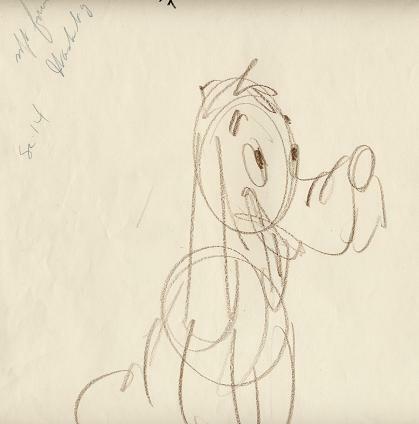 The Original model drawing of 'Fourpaws' is on a Full Sheet (12.50" X 10.50"). The image area measures 4.00" X 8.00", rendered in graphite pencil. The sheet also includes several important animator notes, bearing 14 F across the top right corner.